The sub-title of this book should be a tip off that Valdimir Tismaneanu is wrestling with arguably the most critical question in 20th century European history: how did so much of the continent, where the Enlightenment two centuries previously had provided the blueprint for democratic governance based on religious tolerance and respect for individual rights, stray so far from the Enlightenment’s ideals? In The Devil in History: Communism, Fascism and Some Lessons of the Twentieth Century, Tismaneanu locates the answer in 20th century communism, from its inception quite simply a “criminal system” (p.69), he writes. Tismaneanu’s searing critique hones in on the impact of Bolshevik and Leninist thinking throughout the 20th century, and describes the rethinking that went on in Eastern Europe after the Berlin Wall fell in 1989, when most of the countries of the former Communist bloc committed themselves to democratic governance. A professor of political theory at the University of Maryland and Director of the University’s Center for the Study of Post-Communist Societies, Tismaneanu is a native of Romania brought up under the odious regime of Nicolae Ceaușecu, and thus knows more than a thing or two about how totalitarian governments operate. Tismaneanu indicates in his Forward that he was born after World War II to “revolutionary parents who had embraced anti-Fascist Communist values” (p.ix). His father fought with the International Brigades in the Spanish Civil War in the 1930s, losing an arm, while his mother served as a nurse in that conflict. At age 14, Tismaneanu started to think about the implications of communism after a chance reading of a clandestine copy of Arthur Koestler’s Darkness at Noon. 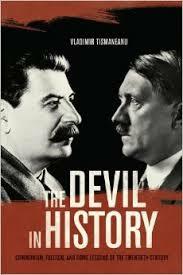 The book’s cover contains an ingenious photo of Stalin and Hitler staring at one another. If you’re talking about the devil in history, you’ve got to start with these two guys, right? Actually, an argument could be made that neither should be on the cover. Despite its sub-title, the book is only secondarily about Fascism and Nazism, emphasizing primarily how, despite ideological differences, they were influenced by the communist model. Moreover, it would have made way more sense to put Vladimir Lenin on the cover rather than Stalin. Stalin in Tismaneanu’s analysis was a ruthless implementer who “carried to an extreme Lenin’s intolerant logic” (p.230). But Lenin was the devil in 20th century European history – “the twentieth century was Lenin’s century” (p.90). Tismaneanu describes Leninism (or Bolshevism; Tismaneanu uses these terms inter-changeably) as a “self-styled synthesis between Marxian revolutionary doctrine and Russian tradition of nihilistic repudiation of the status quo” (p.90). If there had been no Lenin, he goes on to contend, “there would have been no totalitarianism – at least not in its Stalinist version. The October 1917 Bolshevik putsch . . . was “the event that irreversibly changed the course of Western civilization and world history” (p.92). Thanks to Lenin, a “new type of politics emerged in the twentieth century, one based on elitism, fanaticism, [and] unflinching commitment to the sacred cause” (p.90). Leninism was “inherently inimical to political liberties. It is not an accidental deviation from the democratic project but its logical, direct and unequivocal antithesis” (p.120). Leninism was rooted in Enlightenment, with its focus on reason and progress. Leninists “knew how to pose as the heir to the Enlightenment, and many were duped by this rationalistic and humanistic pretense” (p.46). But Leninism was equally rooted in Marx’s theories of transformation and the Russian anarchistic revolutionary tradition, with its “utilitarian nihilism and a quasi-religious socialist vision of the transformation of mankind” (p.112), a tradition which Steven Marks described in How Russia Shaped the Modern World: From Art to Anti-Semitism, Ballet to Bolshevism, reviewed here in December. Lenin took Marx’s broad theories and emphasized the “organizational element as fundamental to the success of revolutionary action” (p.97). Leninism was precisely the type of utopianism which Isaiah Berlin abhorred, sanctifying “ultimate ends, and thus the creation of an amoral universe in which the most terrible crimes could be justified in the name of a radiant future” (p.70). More than a revolutionary response to the inequities of the Tsarist state and the injustices of capitalism, Leninism was an “experiment in ideologically driven, unbounded social engineering” (p.30). Never was a political doctrine “so ambitious, never a revolutionary project so much imbued with a sense of prophetic mission and charismatically heroic predestination” than Leninism (p.90), Tismaneanu concludes. Lenin’s diabolical influence extended to both Hitler and Mussolini. In times of moral and cultural disarray, Tismaneanu argues, Communism and Fascism can “merge into a baroque synthesis. Communism is not Fascism, and Fascism is not Communism. Each totalitarian experiment had had its own irreducible attributes, but they shared a number of phobias, obsessions, and resentments that could generate toxic alliances, like the Nazi-Soviet Pact of 1939” (p.x). The party played a different role under the two regimes. Under Communism the party leader incarnated the wisdom of the party, whereas under Fascism and Nazism the party was entirely secondary to the leader as the charismatic center of power. Fascism and Nazism also lacked the recurring party purges and show trials of the ruling elite as a “mechanism of mobilization, integration, and scapegoating” that characterized Communist regimes (p.53). Nonetheless, the ideologies of Communism and Fascism held in common a “belief in the plasticity of human nature and the possibility of transforming it in accordance with a utopian blueprint” (p.162). Both “identified with the revolution as an irreversible moment breaking with the past and creating a totally new world” (p.118). The two movements were alike in being “essentially and unflinchingly opposed to democratic values, institutions and practices” (p.21) – the “antithesis of the Western humanist legacy” (p.62). By the end of Khrushchev’s rule in the fall of 1964, both in the USSR and Eastern Europe, it was clear that reform within party-defined boundaries had “ceased to be a viable option”( p.136). Tismaneanu sees 1968 as a pivotal year, during which Eastern Europe saw an “explosion of post-revolutionary skepticism,” setting in motion forces that led to the “gradual decomposition of the Communist regimes” (p.142). Futile attempts to find ways of reforming Communism from within were replaced by an emphasis upon human dignity and the inviolability of human rights. The soul of Communism died in Prague in August 1968, Tismaneanu concludes. From that year onward, Communism in the Soviet Union and Eastern Europe was a spent force, with stagnation and immobility becoming its main characteristics. If the Communist soul died in 1968, its emaciated body survived until 1989. The changes which Europe underwent that year start with Mikhail Gorbachev. Tismaneanu regards Gorbachev as a “genuine Marxist revisionist, who, while paying lip service to Lenin’s iconic figure, moved away from Bolshevism as a political culture based on fanaticism, sectarianism, and volunteerism toward a self-styled version of Marxist revisionism” (p.145-46). Gorbachev tried to offer “antidotes to the rampant pathologies of cynicism, corruption and cronyism,” but was “utterly confused as to how to bring about political pluralism while sustaining state socialism” (p.153). Gorbachev’s version of Marxist revisionism was directly inspired by Eduard Bernstein’s evolutionary socialism, but he was “unable to fully abandon the outworked Leninist model, desperately searching for ‘socialism with a human face,’ torn between nostalgia for old ideals and the tragic awareness of their hollowness” (p.153). Neither a neo-Menshevik nor a Western-style Social Democrat, Gorbachev remains the “last and most influential of those East European Leninist leaders who tried to humanize an inherently inhuman system” (p.153). Twenty-five years after the changes of 1989-91, pluralism seems to have settled solidly throughout the former Eastern European Communist bloc, Tismaneanu argues, with democratic practices widely recognized, accepted and practiced. The revolutions of 1989-91 dealt a mortal blow to the “ideological pretense according to which human life can be structured in accordance with scientific designs proposed by a general staff of revolutionary doctrinaires” (p.171). Tismaneanu emphasizes the centrality of civil society to the success of the 1989 transformation, replacing the existing political, social, and economic system with one “founded on the ideals of democratic citizenship and human rights” (p.223). The core value restored, cherished and promoted by the revolutions of 1989 was “common sense. The revolutionaries believed in civility, decency, and humanity, and they succeeded in rehabilitating these values” (p.223). In so doing, they also managed to bring about the “rebirth of citizenship, a category abolished by both Communism and Fascism,” which also involved “re-empowering the truth” (p.221). What we have learned from 1989, Tismaneanu concludes, represents an “unquestionable argument in favor of the values that we consider essential and exemplary for democracy today” (p.221). Still, Tismaneanu cautions, a “residual Bolshevism” (p.114) lingers in the formerly Communist world, certainly in Russia and many of the states of the former Soviet Union. In Russia, Vladimir Putin has instituted a regime euphemistically termed “managed democracy,” an “increasingly aggressive version of neo-Stalinist and neo-imperialist restoration” (p.218). But even in Eastern Europe, the “utopian reservoir of humanity has not been completely exhausted: refurbished ideologies have resurfaced, among them populism, chauvinism, and fundamentalism of different shades” (p.164-65). Communism’s demise has given rise to “disenchantment, dispirited political cultures, the rise of new collectivisms, marginalization of former heroes, and the return of former Communists” (p.194). In brief, the “battle for the soul of man after Communism has not ended” (p.205). As perceptive as Tismaneanu’s insights are, as critical as his subject matter is, a few caveats are in order before you rush out and plunk down something like $20 for the paperback edition of his book. Tismaneanu’s prose is often dense, bordering on turgid. It is riddled with sentences such as: “The disintegration of the Stalinist gnosis as a key self-sufficient system of authoritarian norms and quasi-mystical precepts impelled revisionist intellectuals toward the construction of what Kolakowski called an agnostic Marxism, actually a quixotic attempt to salvage the humanistic kernel of the doctrine lest the whole Marxist utopia fall apart” (p.177); and “The theoretical manifestations of these undercurrents provided a new semantic horizon, the coalescence of a new emotional and intellectual infrastructure that was translated into a resurgence of repressed philosophical topics, above all humanism as a privileged metaphysical concern” (p.134). To be sure, the nuances of Marxist thinking and applications of Communist theories do not always lend themselves to crackling prose. Further, English is not Tismaneanu’s native language, and he has my full admiration for establishing a distinguished career and earning numerous academic distinctions in an acquired rather than native language. This is by itself a remarkable achievement. But some writers achieve genuine fluency and elegance writing in an acquired language. Valdimir Zubok, whose book Zhivago’s Children I reviewed here in November 2012, is one example. Tismaneanu is not there yet (incidentally, Tismaneanu frequently cites Zubok’s work). . . .as A.E. Rees showed. . .To paraphrase Eugen Weber. . .as the Catholic intellectual Adolf Keller wrote. . . as sociologist Michael Mann underlines. . . As Lesek Kolakowski puts it. . .. Paul Berman explains . . . There is of course nothing wrong with one author occasionally quoting another’s work – it is way better than using another’s words without quoting the other writer. The over-reliance on quotations is a common characteristic of too many college term papers and university dissertations. An author writing for general readers should be providing primarily his or her own thoughts, not those of other writers. Born and raised in a particularly virulent form of Communism in Romania, Vladimir Tismaneanu has a wealth of insight to offer readers on the implications of that and other repressive systems of government. But this book, while treating an enticing and still-critical subject, is unlikely to gain the affection of most general readers.